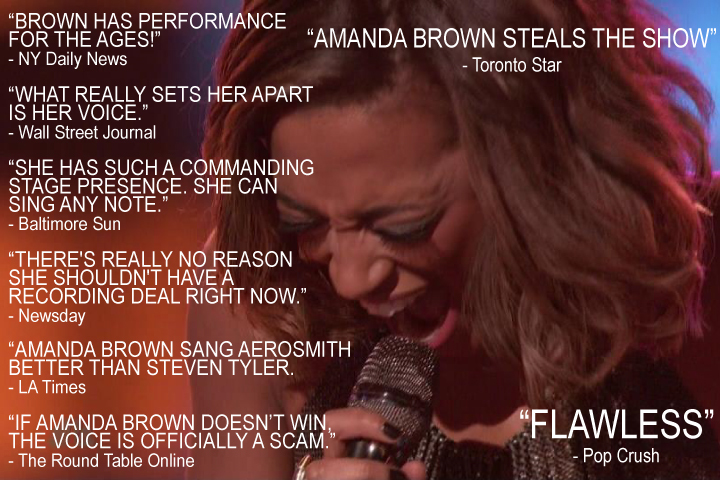 After her spot-on performance of Aerosmith’s “Dream On” on this week’s edition of The Voice, the other nineteen contestants are scurrying back to their rooms, packing bags and high-tailing it back home; Amanda Brown has officially claimed her spot in the finals. Generating a standing ovation from the in-house crowd that continued so long that we didn’t even get to hear what Carson Daily had to say post-performance, the judges went in, giving Brown universal praise. Her coach, Adam Levine was practically jumping onto the stage as he, literally, played air-drums throughout the performance. Stay tuned for Brown’s next performance. Watch the video below. To download the song, click here.